April 2nd, 2019 by Pamela V.
The beginning of a new season can always bring excitement. People are anticipating warmer weather (depending on where you are in the world), a change in daily routine and new social activities that are ahead. Spring is also known for “spring-cleaning,” and it’s the perfect time to dust away some of the cobwebs. If you dread the annual cleaning procedure, think about how it feels to start fresh and clutter-free for the spring season. If you’re already cleaning out your homes and offices here are some tips for spring-cleaning your vehicle. Make sure to keep them in mind when you start cleaning. Start-off by using a gentle fine-bristled brush to brush off any dust and dirt off of surfaces in your car. Use this to remove dust and dirt from the nooks and crannies of your car’s interior on ventilation areas, buttons and the crevices in seat cushions. When vacuuming, make sure to remove all of the dirt from these areas thoroughly. Next up, remove all of the trash, like unused cups and empty bags, and throw them in the trash or recycle them to keep your car clutter-free. The things that need to stay in your car, such as sunglasses and garage door clickers, should be organized in respective storage places to create order. Get an air freshener for aromatic therapy to top it all off. It’s understandable that a lot of useless stuff may pile up in your vehicle trunk during the winter time. As the grass turns green, it’s expected to have empty fluid bottles and many winter items that you won’t need this season. Make sure to vacuum any waste, dust or dirt and don’t forget to shake the trunk carpet liner. Tires don’t get left out from the cleaning as all-over cleanliness, without damaging chemicals, will leave your tires in great shape. When washing your tires, use a non-acid product to get a good clean without damaging the tires with harsh chemicals. Using a medium stiffness brush to remove any tough grime that’s in your tires. When finished, add tire dressing to add some shine, making your tires look like new. To create a sleek look without damaging your car’s paint, a hand wash is best. Use lots of water and a delicate and smooth wash sponge as it’s the best option for your car’s paint. 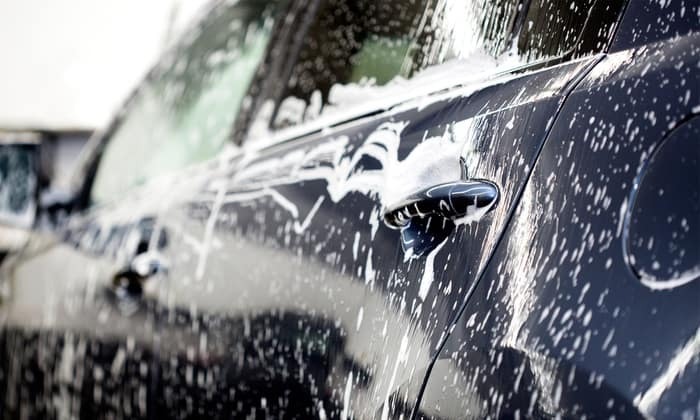 If you use a carwash soap, never use the dish or household soap. These will strip any wax from the paint leaving the finished exposed to the elements. Use a soap made specifically for washing cars. After you wash your car, try using a rubber squeegee or leaf blower to remove the excess water. Letting the water air-dry will potentially leave water spots. Finish off by using a quick-wax to help maintain the finish and water beading properties of the exhisting wax. As for the last bit of order, clean your windows to prevent them from getting dirty from cleaning other parts of the car. Steer clear from using glass cleaner, which can be too harsh for car window tint, and find a cleaner without ammonia to best clean and protect them. To avoid leaving towel marks, streaks or spots, use a microfiber cloth and enjoy a sleek and blemish-free clean. Something that often gets left behind is the grime and oil that collects at the top of your window, so don’t forget to roll your windows down to hit this hard to reach spot. These top five tips for spring-cleaning your car will leave your vehicle fresh and squeaky-clean. Spring is the best time to check that your vehicle is in good working condition after the long winter months. This is the place where all the dirt that can harm your engine gets confined. Having clean engine undeniably extends the life of your vehicle as well as prevents any further mechanical issues. Here’s how to clean under the hood. When you’re cleaning under the hood make sure the engine is off and disconnect the battery cables. It’s also advisable to clean the engine compartment with a detergent made for this purpose. There are many choices that can be picked up at your local auto supply store. To guarantee that the water won’t reach the sensitive areas, don’t forget to dry off your engine. This can be done by closing the hood and running the engine to heat the engine compartment. For any used vehicles visit driverautomart.com or visit 5355 S University Dr. Davie, Florida 33328. It’s open Monday-Friday 9 a.m.-9 p.m., Saturdays 9 a.m.-8 p.m. and on Sundays 10 a.m.-7 p.m.